Tourism has become an important contributor to the domestic economy in China since the beginning of reform and opening in the early eighties. The emergence of an affluent middle class and an easing of movement restrictions for locals and foreign visitors are both supporting this travel boom. The Chinese tourism market has transformed into one of the world's most-watched inbound and outbound tourist markets. It was estimated that the number of domestic trips in China would increase to about 2.38 billion trips by 2020, indicating an increase of over 50 percent compared to the number of trips made within China ten years ago. The total revenue of Chinese travel and tourism industry amounted to 3.94 trillion yuan as of 2016, up 15.2 percent compared to the previous year. The industry contributed 2.1 percent to China's gross domestic product (GDP) and provided around 22.5 million jobs. The impact of tourism on the employment market in China is even larger if indirect employment is taken into account. As of 2015, about 65 million people were indirectly employed by the tourism sector. China boasts a large number of attractions such as historic sites and relics, economic hot spots and a culturally diverse number of minorities. 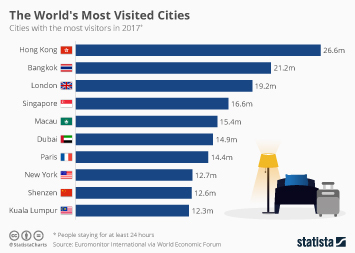 Therefore, the country has become one of the most popular travel destinations for many countries such as Thailand, Japan, South Korea, Maldives, Russia, and United Kingdom. Revenue from inbound tourism to China reached 114 billion U.S. dollars by 2015. In terms of international visitor arrivals in China around 134 million visitors were counted in 2015, of whom only 26 million were from overseas, while the majority came from Hong Kong and Macao SAR. The same year, the number of international tourist overnight stays in the Guangdong province reached 34.5 million, far more than in any other province or region of China. Ningxia, Gansu and Qinghai were the least visited regions in China by international visitors in the past few years. For outbound tourism, spendings of Chinese outbound travelers reached approximately 292 billion U.S. dollars. The most popular travel destination for young Chinese luxury travelers was Europe with a share of 61 percent, followed by Japan and South Korea. The leading international travel destinations of the mass market in China are Canada, Singapore, Australia, Japan and the United States. China's growing economy is also generating a surge in business travel. As of May 2015, the main business travel purposes among Chinese enterprises were meetings, trainings, different kinds of conventions and exhibitions, including project work and sales product shows.